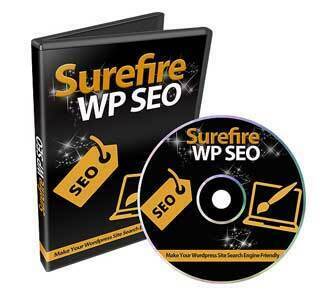 Learn how to make your site search engine friendly to rank consistently in all search engines with our 8 part surefire wp seo video course. Finally, Discover How to Rank Your WordPress Site Consistently On Google and Other Search Engines…Starting Today! I know – it’s frustrating, until you really get the basics. But work alone isn’t going to get you anywhere. The reality of it all is that your website’s ranking can be changed due to the recent Google Penguin, Google Panda, and all the other means of changing the search engine algorithms. Building your business on top of uncertainty is never a good feeling. And this very reason is why a lot of people are afraid. First of all is on-page optimization, which basically means how you will make your website more search engine friendly so they know exactly what you are talking about. Second is off-page optimization, and these things include social backlinks of all sorts of types along with high authority sites linking to you. What are the things you need to do and keep doing over and over again? That’s really the main question. In this particular video, you’ll be given a quick overview of the course. We’ll discuss how to get into the right mindset before you get started so that things will come more naturally and you will be able to get better, more consistent search engine rankings in the future. We’ll also cover tools that you can use to dramatically help you in this process. Video #2 – What’s the Intent of a Keyword? Before you go out and try to simply grab a bunch of keywords, you really need to get down to the basics. Different keywords can mean different things, and not understanding where your buyer is in the process can set you up for failure. After you have understood the intent, it’s time find keywords. Plus, you’ll need to understand the basics of LSI. But we’re not using the Google Keyword Planner for this. Instead, we are going to use something else – something much more effective. Once you have understood LSI and gotten your keywords, it’s time to understand how on-page optimization works. URL structures. Your domain name. Should you use brand names or keyword names? Which things stay consistent? Which things change that you need to be aware of? The bottom line is that if you know what stays consistent and you just keep implementing them over and over again, this will truly change your ranking for the better. Everything discussed in Video #4 will be implemented here. Of course, the goal is for you to learn and implement. We’ll discuss URL structuring, categories, and site structure. A site without content is nothing. You need content. So how should you write your articles or blog content to ensure they are SEO optimized? What WordPress plugins should you use? What settings should you use? While we have tested several different plugins, we have gotten better results with some over others. There’s more on that in this video. As promised, we will use a small portion of the course to cover backlinks. What types of backlinks should you focus on or avoid? Why is Trust Flow important? What tools can you use to detect this? And much more. Grab this video course now so that you can start ranking and driving traffic to your site consistently! Watch this online course immediately after purchase – there’s no waiting. This training course is designed to show you exactly how you can keep your rank position consistent.